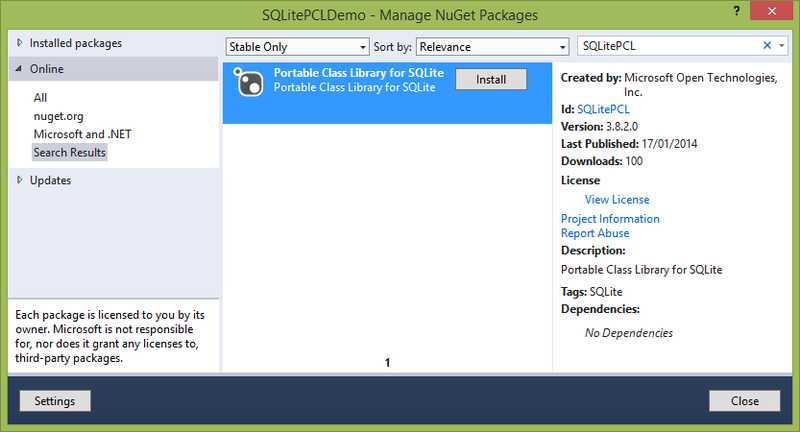 Microsoft Open Technologies has recently released a Portable Class Library for SQLite. Thanks to it, we can use SQLite in the same way in all the supported platforms. Let’s see how to do that. Because it is a native library, the “Any CPU” architecture is not supported, so we need to choose a specific target platform: Visual studio will reference the appropriate extension SDK version when the project compiles. First of all, we create an SQLiteConnection object that points to the specified file. If it isn’t rooted, the library assumes that it is located in the ApplicationData.Current.LocalFolder folder (the same assumption applies also for Windows Phone 8). At this moment, SQLite PCL supports only direct SQL commands (no LINQ provider). At line 3, we use the connection.Prepare method to define the DDL query we want to execute. Then, on line 8, with statement.Step, we send the query to the database engine, that immediately executes it. // Resets the statement, to that it can be used again (with different parameters). Again, the Prepare method is used to define the SQL command. In this case, it is an INSERT in which we have defined two parameters, @firstName and @lastName. At line 4-5, we bind them to their actual values, using the Bind method. The Step command (line 8) finalizes the operation. Then, because we want to reuse the same statement to insert another record, we need to call Reset (line 11), that resets the prepared statement back to its initial state, ready to be re-executed, and ClearBindings (line 12), to remove the bindings that have been defined before. To read the records returned by the query, we need to iterate through the rows, in a way that resembles the SqlDataReader.Read method. As we have seen, this library is very straightforward. Its usage mimics the native C++ library (the Prepare, Step and Reset methods, for example), with a great advantage: we can code against one single API, regardless of whether we’re developing Windows Store, Windows Phone or .NET 4.5 projects. More information about the Portable Class Library for SQLite are available on CodePlex. However, nothing is written about, where an existing database has to be deployed. On WP8 I found out that I had to copy the DB to IsolatedStorage first, prior its use. Under Win 8 I’m not sure what to do, cause sometimes adding the DB as content to the project works, and sometimes not. Any thoughts or advices?